There may be times when a health concern or injury prevents you from eating solid foods. It may not require a full liquid diet but rather something that provides you relief if you are unable to chew or digest normally. In instances like these, you may be advised to eat a puréed diet which offers more in the way of fiber and balanced nutrients. And, unlike a liquid diet, you can remain on a puréed diet for a longer period of time. While a puréed diet shouldn't replace a normal diet (except for certain elderly people in long-term care), it can be safe and beneficial as long as you meet your daily nutritional goals as outlined in the 2015-2020 Dietary Guidelines for Americans. There can be many reasons why you would need a puréed diet. In some cases, it may act as a bridge between a liquid diet and a normal diet as you recover from an illness or surgery. In others, it may be a long-term solution for people who, for any number of reasons, cannot tolerate solid foods. 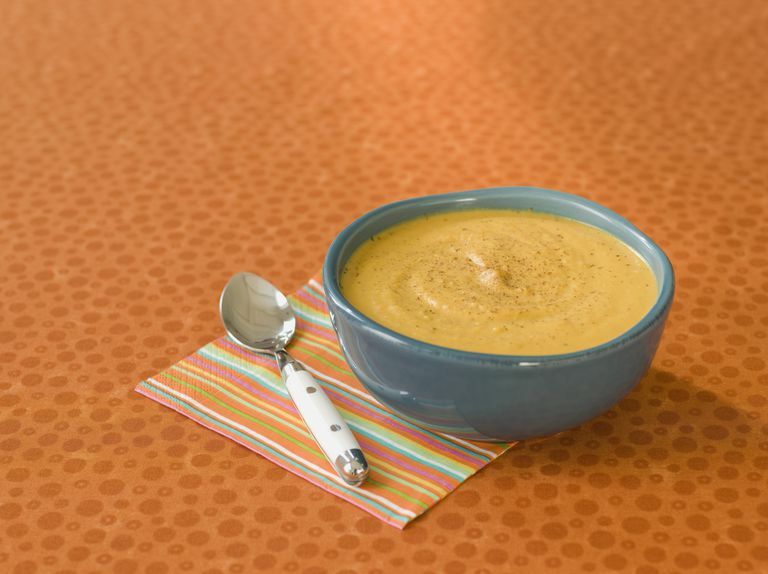 The dietary goals for a puréed diet are no different than that for a regular diet. With that being said, it can be tricky getting the right balance of protein, carbohydrates, fats, and nutrients if you are accustomed to a standard meat-and-potatoes routine. For a puréed diet to succeed, the food will need to be soft enough so that your tongue can pass it to the back of the throat without chewing. It should also be palatable and homogenous—essentially the consistency of pudding or baby food—so that it places little stress on the digestive tract and doesn't get snagged on sores, ulcers, or surgical wounds along the way. Because the recommended daily nutritional needs can vary from person to person, it is important to consult with your doctor or a qualified nutritionist to establish your personal goals and needs. The major challenge, of course, is finding the appropriate food sources to meet these goals. This includes finding alternative proteins and insoluble fiber sources to replace meats, vegetables, and whole grains unsuitable for a puréed diet. As long as you have a good blender, a puréed diet is easy to follow. Almost any food that is soft (or can be cooked soft) will do. Always start by puréeing the hardest foods (like meat) first. You can then add the softer base ingredients and further thin the purée with broth, milk, soy milk, fruit juice, vegetable juice, or water. For a smoother consistency, press the purée through a strainer with a rubber spatula or spoon. Generally speaking, you will want to avoid anything especially fibrous or seedy unless you can strain the fibers and seeds out. You can further round out the flavor and consistency by adding mayonnaise, sauces, or gravies. In terms of suitable protein sources, some people will rely on commercial protein powders and shakes found in drug, health food, and grocery stores. While excellent for short-term use, they should never be used on an ongoing basis as your primary protein source. Whenever possible, focus on real food sources including canned tuna, canned chicken, canned spiced ham (Spam), soft tofu, shrimp, smooth peanut butter, hummus, fish paste, low-fat refried beans, smoked salmon, and imitation crab sticks (found in Asian food markets). If choosing fresh meat, always go for leaner cuts with less sinew or fibrous tissue. You can make an Asian-style congee by slow cooking rice with ginger, canned chicken, and chicken broth until soft and easily puréed. You can purée refried bean, cornbread, canned chicken, and Mexican seasoning and serve with a little puréed salsa, guacamole, and sour cream on the side. You can cook canned tuna, chicken stock, peeled potatoes, celery, and onion until soft and then purée and strain for a chowder-like soup. Thin with milk as needed. You can make extra-soft polenta by stirring in fresh ricotta and a little cream or broth. You can then make a quick puttanesca sauce by stirring anchovy paste into a storebought marinara. You can make puréed meat more appealing by stirring in gravy or barbecue sauce and serving it alongside a mash made of equal parts potato and cauliflower. You can take a cold hard-boiled egg and purée with a little smoked salmon, dill, and mayonnaise for a tasty light lunch. In addition to storebought puddings and ice cream, high-protein smoothies are an excellent complement to any puréed diet. To get a more exact nutritional count, you can input the individual ingredients of your meal into this handy online nutritional calculator. Office of Disease Prevention and Health Promotion. (2015) 2015-2020 Dietary Guidelines for Americans. Washington, D.C.: Department of Health and Human Services.